Do you always forget something when you go on a trip? I do. Unfortunately, in this case, it was my running shoes. I don’t know how I managed to remember a hydration pack and bottles but forget trainers. Actually, it didn’t matter as I was going to be in Essaouira and planned to run along the beach. My hostess, Freya, told me she wouldn’t be joining me early the next morning, but she kindly lent me her bathroom flipflops to get me out of the city and onto the sand. 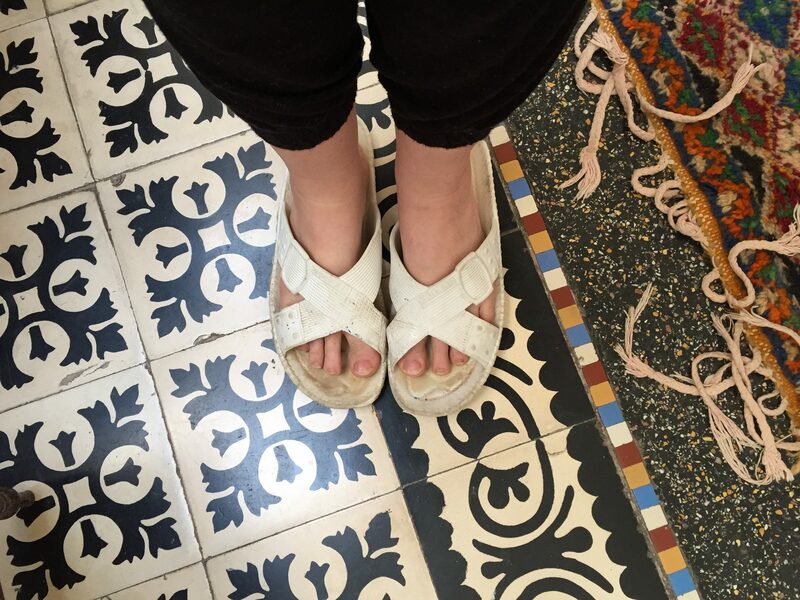 I didn’t need an alarm as the muezzin woke me at 6 am with the call to prayer and after an internal tussle to get out of bed that early, I left, clad all in the latest tech gear – except for my feet. Dawn was breaking in pink splendour as I left the old city through Sbaa Gate and headed for the deserted beach. I secreted Freya’s flipflops behind the wall of a local cafe with a rock on top of them and set off on my gallop across the sands. Perhaps it would be more accurate to say my trot across the sands. What a glorious run. Clear sky and clean air. None of the craziness of Marrakech. No cars and no pollution and not even any people. It was heavenly. But disaster awaited me on my return. No flipflops. The rock was cast aside and the scene was empty. Grrrrr! I knobbled one of the workmen who was digging up the pavement nearby. “No, Lalla, where did you leave them? By this point a little crowd had gathered and we were all enjoying a mutual headshake and tut over how the world had gone to pot and things weren’t like they used to be in the good old days. Then my knight in a shabby, striped robe arrived, carrying his fishing rod and an old plastic bag. He reached into it, and presented me with a pair of white plastic sandals. “For you,” he said, pressing them into my hands. “Don’t worry, my sister, it is not always about the money, ” he replied with the sweetest of smiles. And that is reason number 392 that I love living here in Morocco. We were staying in Tangier, arriving back into our room the first day we found the fruit we had bought had almost all been taken. I am embarrassed to say we spoke to a Manager about it, his very polite answer made us realise what petty, ungenerous and downright mean we were. We learned a great deal during our trip to Morocco and hope we are better for it. I am glad you had an interesting trip to Morocco. I am sure you are not mean at all and it sounds like you took a real interest in what people had to say.